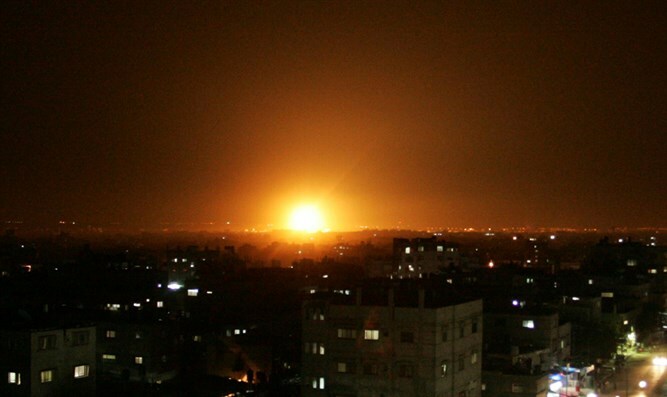 A senior political source said today that despite the rocket fire and rioting, Israel is utilizing its options in Gaza. According to the source, Israel is not adopting a policy of restraint against Hamas. "Hamas has suffered a tremendous blow like it has not suffered since Protective Edge and did not return a single shot. "We have more possible blows to deal and we're planning them, if necessary. After seven months we're on the edge between a flare-up and calm, and we may need to deal more severe blows. There's no restraint against Hamas," the source said in conversation with political reporters. "We're trying to bring about a situation where the actions we take stop the attacks and bring about a period of quiet, so we have to avert the fear of a humanitarian collapse and therefore we agreed to UN and Egypt mediation." The senior official revealed that Israel and Hamas were on the brink of an agreement on a lull before March 29. "It unraveled last Friday, two days after they received fuel. In response, we acted four times as hard as the response to the shooting in Be'er Sheva." Answering Arutz Sheva regarding the nature of the arrangement, the source said "there's no political arrangement with anyone who wants to destroy us, what there is here is a deterrent and humanitarian solution. The choice here is between occupying Gaza and transferring it to another Arab element - and there's no such element who is interested - or to deal severe blows and take time until there's quiet. If there was an interested party, it's possible we might be occupying Gaza." The senior official also referred to the situation between Israel and Russia after the downing of the Russian plane. "The IDF attacked Syria even after the fall of the Russian plane. Military coordination with the Russians continues as in the past." He added that efforts were being made to arrange a meeting between Prime Minister Netanyahu and President Putin as soon as possible, which could happen next month.